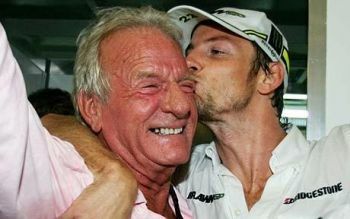 It is with great sadness that we today learned of the death of John Button, father of Jenson Button, Formula 1 World Champion 2009. John Button, father of Jenson and one of the most charismatic people in the F1 paddock of the last 15 years has died at the age of 70. His loss is a source of great sadness to me as he was one of my favourite people in the sport. He is believed to have suffered a heart attack at his home in the South of France. John was a terrific man; very funny, irreverent and loved by many in F1 regardless of their team affiliation or whether they had ever had anything to do with him or Jenson. He could wander into any teamâ€™s base, knew mechanics on every team and reminded everyone of the fun side of the sport. But he was also serious about racing and understood it very well. A former rally cross driver, who worked as an engine tuner in karting, he saw all of the star drivers of the last 25 years starting out on the ladder and was a very good judge of talent. A fundamental part of Jenson Buttonâ€™s inner circle from his debut in F1 in 2000, one of Johnâ€™s strengths was that he was as good at listening as he was at talking and he was very astute at gathering information and advising his son, where appropriate. He had a light touch, unlike many sporting dads. He stayed in the background, didnâ€™t interfere with the team, but always kept listening and learning. I first met him when I was commentating on the Macau Grand Prix in 1999. Jenson was 19 and had finished third in the British F3 championship and was making his Macau debut. I was nine years into my F1 career and two years into the ITV F1 contract at the time, broadcasting F1 to the UK and other English language countries. John asked me to lunch in the Italian trattoria above the old pit building with him, Jenson and their trainer at the time. He wanted to know about F1; how it works, who were the good and bad guys, what were the teams looking for, how the TV and media worked and so on. We spent over two hours talking. Iâ€™m sure it was part of a methodical programme of listening and learning to F1 insiders and gaining as much knowledge as possible. They knew that there was a chance to enter F1, Prost and Williams were interested and Jenson eventually signed for Williams. I had recently published the book on Michael Schumacher â€œQuest for Redemptionâ€, which laid out a lot of Schumacherâ€™s methodology. I had spent a fair bit of time with him and Ross Brawn, who was then the technical director of Ferrari and who later became Jensonâ€™s team boss. It had been a fascinating process, learning the inner workings of that relationship. To me, the key to it was being able to maintain consistency at a high level and never giving anything away to the opposition and I told Jenson and John that. Ross created the right environment for Schumacher to thrive and Schumacher kept it on the limit the whole time. He didnâ€™t question Rossâ€™ demands, he just did it. I spent a lot of time with John at racetracks over the years, comparing notes, listening to old war stories and insights into the current F1 scene. He told me some fascinating stories about Jensonâ€™s rise to the top, including the decisive moment where he said to his son, â€œWe have to make a decision now; either we do this for fun or we do it for real and make a career of it.â€ Button didnâ€™t hesitate and told his father that he wanted to go for it. He went on to win the 2009 World Championship. It was the greatest prize imaginable for John. His son, the world champion. No-one deserved it more than John, for all that he had put in and the support he had given. Some people achieve greatness themselves and some are able to live it vicariously through their children. John Button was clearly in the latter category, but few dads could have derived more pleasure than John did from the moment. There was something great about the way his lifeâ€™s ambition for his son came together. Gil de Ferran, who ran the Honda team when Jenson was there, once observed to me, â€œHis (Jensonâ€™s) Dad is always a help, because the belief and the emotional support of his Dad has never wavered. Having a guy next to him who has been supporting him since his childhood must be a good thing, because it must give you strength. Jenson has lost that now and it must feel like losing a limb. F1 is an immeasurably poorer place for the loss of John Button. Deepest sympathies to his family.